Good news have risen from the emirates state of Dubai’s property sector as sales and house prices were pushed higher by investors demand fleeing the Arab Spring. 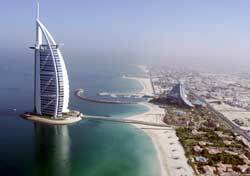 The Dubai Land Department the Global Economic Survey has indicated that land transactions in Dubai rose 21% in the first six months of 2012. This data further attests to the business confidence index released within the Global Economic Survey which shows Dubai besting US, UK and Hong Kong. According to reports from the Global Edge, Jones Lang La Salle and CBRE Richard Ellis, Dubai has been considered the safe haven for investors from other Middle Eastern countries now facing the Arab Spring. Data from Jones Lang La Salle said the high-end villa prices have kicked up 21% in 2012, while apartment prices rose 1% during the second quarter of the year. First half sales of Nakheel and Emaar Properties are on the positive during the first half of the year: Nakheel had a 36% increase in net profits, while Emaar doubled earnings in second quarter. Emaar Properties owns the tallest tower, the Burj Khalifa, which is a prime commercial and residential space provider. CBRE said there are still areas in the peripheries of Dubai that suffered heavy price falls because of the several apartment projects to rise up, but generally the positive outlook is there because the city sits at the frontier of business for the Middle East. With the Dubai economy projected to churn 950,000 jobs by 2020, demand for homes and apartments will still be high, the reports said.